He had every right to become the angriest of men. For twenty- seven falls, winters, springs and summers, nine thousand eight hundred and sixty two days and nights, he lived in a cell as prisoner number 4664 because he dared to challenge the status quo in his minority ruled country. Apartheid pained him. When he rose to power after his twenty- seven years in the cage, he could have become a blood- thirsty and vengeful man. But he didn’t; instead he formed a multiracial democracy and set about helping all his countrymen heal. When Mandela went to prison in the early 1960’s the whole world was in love with Fidel and the young bearded rebels. It was almost unavoidable. The world press created a myth around them that in far away Africa must have been an inspiration to a young black man who was trying to change his world. Mandela was opposed to imperialism. The United States considered him a terrorist and played a part in his 1962 arrest. President Reagan vetoed the Anti-Apartheid Act. On the other hand, Fidel opposed apartheid and supported the African National Congress, Mandela’s organization. When Mandela found himself alone with his fever for freedom, it was Fidel he saw as his ally. Perhaps the loyalty Fidel’s support engendered in him, made him blind to Cuba’s reality as it did so many others with less motive to love him. Perhaps that is why when he was liberated he traveled to Cuba with a heart full of gratitude and fell into the arms of a man he considered to be a friend, when in reality he was embracing a man who had no use whatsoever for the black race. I know that to be a fact. The controversy that my Facebook posts about Mandela created among my Cuban friends, prompted me to speak tonight. I am mindful of their disillusionment at the sight of an embrace that defied logic and felt like betrayal. And I hope that as they have in the past, they will respect a different point of view. When I see Mandela, I see a man of courage. I see a man committed to peace and the freedom of his people. I see a man who could have hated but loved, a man who could have become bitter but chose laughter, a man who wore his dignity like a crown, and whose fame never blinded him to his simplicity. And I see a girl. I see a girl raised by nuns who taught her to love the poor, a girl whose rich grandmother taught her to sew clothes for poor children, a girl who loved Jesus, a Jesus who loved everyone and hung out mostly with sinners because they needed him most. I see a girl who was easily wounded by injustice, who greeted the bearded men with their crucifixes around their necks and their rifles glinting in the tropical sun with the illusion that perhaps one day she would be part of a society made better by a great man. A girl whose heart broke in exile, not because Mandela visited Fidel, but because Fidel and his beautiful bearded men betrayed her soul and the soul of her country. Tonight I salute the man who was known as Madiba by his people. I salute him for his courage, for his loving nature, and for his ability to forgive the unforgivable. May he rest in peace. Thanks for putting in context the circumstances which led Mandela to think of Fidel Castro as a great leader. This underscores the need there is for those who witnessed and are still witnessing the horrors of the Castro tyranny to let the world know the truth about Cuba. 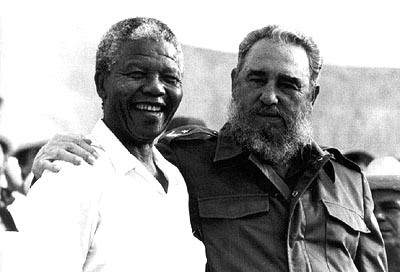 Regarding Mandela, who expressed in his writings that he regretted that many tended to look upon him as a saint, his picture with Fidel Castro focuses on his limitations. One would have hoped that as an older man he would have examined his convictions about Castro. I much prefer photos of him without Fidel. It is for this reason that I shared on my Facebook page Yoani Sanchez’s blog on Mandela. As he is laid to rest, let’s put aside his limitations, and focus on the great qualities that made him the great leader that he was. Thank you, Elena, for sharing your always treasured opinions. That you can put aside the pain to celebrate Mandela’s being, speaks to your own goodness and compassionate heart. Thank you for visiting the blog and for teaching me to breathe peace, my friend. You gave us your vision of Mandela: “I see a man of courage…” What do you see when you remember Fidel. Thanks for this enlightening post! You, my dear Tocaya, are one of the most loving people I know -and I’ve been blessed to know you. I also see a man of courage in Mandela. I think it takes more courage to rise above the primitive part of our nature that impels us to lash out when confronted with something we fear or do not understand. It takes a concerted effort to allow our civilized brain to convince us to stand strong and use reason and compassion to handle difficult situations regarding other people. Elena reminds us of Mandela’s humility, of his sense of being capable of making mistakes, and his formula was to keep trying to make things right. I wonder if he was ever aware in his later years of Castro’s betrayal of the principles of freedom he had touted at the beginning of his revolution. I imagine he would have scolded Fidel, but privately, in honor of a friendship forged under different circumstances. Perhaps Mandela did see eventually that Fidel became a man corrupted by power who led his people with an iron hand in order to maintain power. Who knows if, like the rest of us, he concluded that Fidel was beyond the reach of reason? I guess we just can’t know. As to Anne Hendren’s question, it made me wonder how I see Fidel, and this is my first response: as a pathetic man, a petty tyrant, a tragic caricature of a failed leader. I hate the calamity he brought onto my country, but I can’t hate him anymore. I won’t allow him to imprison me that way. Yoli, I like Wayne Dyer’s work. Thank you for your beautiful and loving comment. I treasure your friendship. “It takes more courage to rise above the primitive part of our nature…..” Yes, it does. And like you, I choose not to hate Fidel for the same reason. Tocayas in more ways than one, you and I.